The image below depicts a TENS unit. TENS (Transcutaneous Electrical Nerve Stimulator). Image courtesy of Wikimedia Commons. See Pain Management: Concepts, Evaluation, and Therapeutic Options, a Critical Images slideshow, to help assess pain and establish efficacious treatment plans. Studies show marked increases in beta endorphin and met-enkephalin with low-frequency TENS, with demonstrated reversal of the antinociceptive effects by naloxone. These effects have been postulated to be mediated through micro-opioid receptors. Research indicates, however, that high-frequency TENS analgesia is not reversed by naloxone, implicating a naloxone-resistant, dynorphin-binding receptor. A sample of cerebral spinal fluid in those subjects demonstrated increased levels of dynorphin A. The mechanism of the analgesia produced by TENS is explained by the gate-control theory proposed by Melzack and Wall in 1965. The gate usually is closed, inhibiting constant nociceptive transmission via C fibers from the periphery to the T cell. When painful peripheral stimulation occurs, however, the information carried by C fibers reaches the T cells and opens the gate, allowing pain transmission centrally to the thalamus and cortex, where it is interpreted as pain. The gate-control theory postulates a mechanism by which the gate is closed again, preventing further central transmission of the nociceptive information to the cortex. The proposed mechanism for closing the gate is inhibition of the C-fiber nociception by impulses in activated myelinated fibers. Conventional TENS has a high stimulation frequency (40-150 Hz) and low intensity, just above threshold, with the current set between 10-30 mA. The pulse duration is short (up to 50 microseconds). The onset of analgesia with this setup is virtually immediate. Pain relief lasts while the stimulus is turned on, but it usually abates when the stimulation stops. Patients customarily apply the electrodes and leave them in place all day, turning the stimulus on for approximately 30-minute intervals throughout the day. In individuals who respond well, analgesia persists for a variable time after the stimulation stops. In acupuncturelike settings, the TENS unit delivers low frequency stimulus trains at 1-10 Hz, at a high stimulus intensity, close to the tolerance limit of the patient. Although this method sometimes may be more effective than conventional TENS, it is uncomfortable, and not many patients can tolerate it. This method often is considered for patients who do not respond to conventional TENS. Pulsed (burst) TENS uses low-intensity stimuli firing in high-frequency bursts. The recurrent bursts discharge at 1-2 Hz, and the frequency of impulses within each burst is at 100 Hz. No particular advantage has been established for the pulsed method over the conventional TENS method. Patient comfort is a very important determinant of compliance and, consequently, of the overall success of treatment. The intensity of the impulse is a function of pulse duration and amplitude. Greater pulse widths tend to be more painful. The acupuncturelike method is less tolerable, because the impulse intensity is higher. The amount of output current depends on the combined impedance of the electrodes, skin, and tissues. With repetitive electrical stimuli applied to the same location on the skin, the skin impedance is reduced, which could result in greater current flow as stimulation continues. A constant current stimulator, therefore, is preferred in order to minimize sudden, uncontrolled fluctuations of current intensity related to changes in impedance. An electroconductive gel applied between the electrode and skin serves to minimize the skin impedance. Medical complications arising from use of TENS are rare. However, skin irritation can occur in as many as 33% of patients, due, at least in part, to drying out of the electrode gel. Patients need to be instructed in the use and care of TENS equipment, with particular attention to the electrodes. In some cases, individuals react to the tape used to secure the electrodes. Skin irritation is minimized by using disposable, self-adhesive electrodes and repositioning them slightly for repeated applications. The use of TENS is contraindicated in patients with a demand-type pacemaker, because the stimulus output of the TENS unit may drive or inhibit the pacemaker. Interferential current therapy (IFC) is based on summation of 2 alternating current signals of slightly different frequency. The resultant current consists of a cyclical modulation of amplitude, based on the difference in frequency between the 2 signals. When the signals are in phase, they summate to an amplitude sufficient to stimulate, but no stimulation occurs when they are out of phase. The beat frequency of IFC is equal to the difference in the frequencies of the 2 signals. For example, the beat frequency and, hence, the stimulation rate of a dual channel IFC unit with signals set at 4200 and 4100 Hz is 100 Hz. IFC therapy can deliver higher currents than TENS can. IFC can use 2, 4, or 6 applicators, arranged in either the same plane, for use on such regions as the back, or in different planes in complex regions (eg, the shoulder). Literature on the effectiveness of transcutaneous electrical nerve stimulation (TENS) in a variety of medical conditions reports a wide range of outcomes, from very positive to negative. Currently, there is an overall consensus favoring the use of TENS, with authorities differing on its value in different clinical situations. Generally, TENS provides initial relief of pain in 70-80% of patients, but the success rate decreases after a few months or longer to around 20-30%. To exclude a false-negative response, a trial of TENS for at least 1 hour should be given to confirm potential benefit from subsequent continuous use. Patients differ in their stimulus preferences and in their rates of compliance. In Johnson's study of compliance in patients who benefited from TENS, 75% used the device on a daily basis. Patients showed individual preferences for particular pulse frequencies and patterns, and they consistently adjusted their stimulators to these settings in subsequent treatment sessions. Musculoskeletal pain - Examples of specific diagnoses include joint pain from rheumatoid arthritis and osteoarthritis, acute postoperative pain (eg, postthoracotomy), and acute posttraumatic pain. [13, 14, 15, 16, 17, 18, 19] After surgery, TENS is most effective for mild to moderate levels of pain, and it is ineffective for severe pain. The use of TENS in chronic LBP and myofascial pain is controversial, with placebo-controlled studies failing to show statistically significant beneficial results. A literature-study report from the American Academy of Neurology recommended against the use of TENS for the treatment of chronic LBP, stating that the strongest evidence indicates that it is ineffective against this condition (Level A). Uncertainty also exists about the value of TENS in tension headache. TENS should not be used in patients with a pacemaker (especially of the demand type). TENS should not be used during pregnancy, because it may induce premature labor. TENS should not be applied over the carotid sinuses due to the risk of acute hypotension through a vasovagal reflex. TENS should not be placed over the anterior neck, because laryngospasm due to laryngeal muscle contraction may occur. The electrodes should not be placed in an area of sensory impairment (eg, in cases of nerve lesions, neuropathies), where the possibility of burns exists. A TENS unit should be used cautiously in patients with a spinal cord stimulator or an intrathecal pump. In one study of elderly patients with chronic low back pain (LBP), acupuncture and TENS had demonstrable benefits, with the acupuncture group demonstrating improvement in spinal flexion. In patients with chronic LBP and sciatica, PENS was more effective than TENS in providing short-term pain relief and improved function, including an improved quality of sleep and sense of well-being. Overall, 91% and 73% of patients, respectively, chose PENS as the preferred modality for pain relief in LBP and sciatica. PENS has been used successfully for pain relief in patients with acute herpes zoster and in persons suffering from cancer with bony metastases. IFC and TENS had a statistically significant effect on the median nerve excitation threshold in young women. 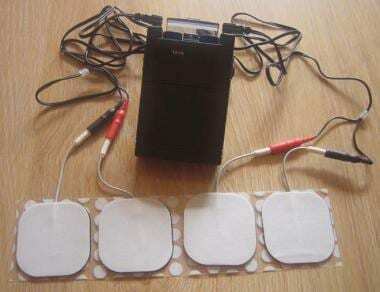 Nnoaham KE, Kumbang J. Transcutaneous electrical nerve stimulation (TENS) for chronic pain. Cochrane Database Syst Rev. 2008 Jul 16. CD003222. [Medline]. Fernandez-Del-Olmo M, Alvarez-Sauco M, Koch G, et al. How repeatable are the physiological effects of TENS?. Clin Neurophysiol. 2008 Aug. 119(8):1834-9. [Medline]. Peters K, Carrico D, Burks F. Validation of a sham for percutaneous tibial nerve stimulation (PTNS). Neurourol Urodyn. 2008 Jul 31. [Medline]. Robb KA, Bennett MI, Johnson MI, et al. Transcutaneous electric nerve stimulation (TENS) for cancer pain in adults. Cochrane Database Syst Rev. 2008 Jul 16. CD006276. [Medline]. Basbaum AI, Fields HL. Endogenous pain control mechanisms: review and hypothesis. Ann Neurol. 1978 Nov. 4(5):451-62. [Medline]. Clement-Jones V, McLoughlin L, Tomlin S, et al. Increased beta-endorphin but not met-enkephalin levels in human cerebrospinal fluid after acupuncture for recurrent pain. Lancet. 1980 Nov 1. 2(8201):946-9. [Medline]. Melzack R, Wall PD. Pain mechanisms: a new theory. Science. 1965 Nov 19. 150(699):971-9. [Medline]. Johnson MI, Ashton CH, Thompson JW. An in-depth study of long-term users of transcutaneous electrical nerve stimulation (TENS). Implications for clinical use of TENS. Pain. 1991 Mar. 44(3):221-9. [Medline]. Cheing GL, Hui-Chan CW. Transcutaneous electrical nerve stimulation: nonparallel antinociceptive effects on chronic clinical pain and acute experimental pain. Arch Phys Med Rehabil. 1999 Mar. 80(3):305-12. [Medline]. De Ridder D, Plazier M, Menovsky T, Kamerling N, Vanneste S. C2 Subcutaneous Stimulation for Failed Back Surgery Syndrome: A Case Report. Neuromodulation. 2013 Jun 5. [Medline]. Liebano RE, Vance CG, Rakel BA, Lee JE, Cooper NA, Marchand S, et al. Transcutaneous electrical nerve stimulation and conditioned pain modulation influence the perception of pain in humans. Eur J Pain. 2013 May 6. [Medline]. Moreno-Duarte I, Morse L, Alam M, Bikson M, Zafonte R, Fregni F. Targeted therapies using electrical and magnetic neural stimulation for the treatment of chronic pain in spinal cord injury. Neuroimage. 2013 May 30. [Medline]. Cottingham B, Phillips PD, Davies GK, et al. The effect of subcutaneous nerve stimulation (SCNS) on pain associated with osteoarthritis of the hip. Pain. 1985 Jul. 22(3):243-8. [Medline]. Law PP, Cheing GL. Optimal stimulation frequency of transcutaneous electrical nerve stimulation on people with knee osteoarthritis. J Rehabil Med. 2004 Sep. 36(5):220-5. [Medline]. Ottawa Panel evidence-based clinical practice guidelines for electrotherapy and thermotherapy interventions in the management of rheumatoid arthritis in adults. Phys Ther. 2004 Nov. 84(11):1016-43. [Medline]. Taylor P, Hallett M, Flaherty L. Treatment of osteoarthritis of the knee with transcutaneous electrical nerve stimulation. Pain. 1981 Oct. 11(2):233-40. [Medline]. Pike PM. Transcutaneous electrical stimulation. Its use in the management of postoperative pain. Anaesthesia. 1978 Feb. 33(2):165-71. [Medline]. Cetin N, Aytar A, Atalay A, et al. Comparing hot pack, short-wave diathermy, ultrasound, and TENS on isokinetic strength, pain, and functional status of women with osteoarthritic knees: a single-blind, randomized, controlled trial. Am J Phys Med Rehabil. 2008 Jun. 87(6):443-51. [Medline]. Cipriano G Jr, de Camargo Carvalho AC, Bernardelli GF, et al. Short-term transcutaneous electrical nerve stimulation after cardiac surgery: effect on pain, pulmonary function and electrical muscle activity. Interact Cardiovasc Thorac Surg. 2008 Aug. 7(4):539-43. [Medline]. [Full Text]. Dubinsky RM, Miyasaki J. Assessment: efficacy of transcutaneous electric nerve stimulation in the treatment of pain in neurologic disorders (an evidence-based review): report of the Therapeutics and Technology Assessment Subcommittee of the American Academy of Neurology. Neurology. 2010 Jan 12. 74(2):173-6. [Medline]. Tugay N, Akbayrak T, Demirtürk F, et al. Effectiveness of transcutaneous electrical nerve stimulation and interferential current in primary dysmenorrhea. Pain Med. 2007 May-Jun. 8(4):295-300. [Medline]. Borjesson M, Eriksson P, Dellborg M, et al. Transcutaneous electrical nerve stimulation in unstable angina pectoris. Coron Artery Dis. 1997 Aug-Sep. 8(8-9):543-50. [Medline]. Jayme MK, Concha ME, Sarino JA, Uy HG. Effectivity of the electronic dental anesthesia in controlling pain caused by local anesthetic injections. J Philipp Dent Assoc. 1998 Dec-1999 Feb. 50(3):39-52. [Medline]. Chen L, Tang J, White PF, et al. The effect of location of transcutaneous electrical nerve stimulation on postoperative opioid analgesic requirement: acupoint versus nonacupoint stimulation. Anesth Analg. 1998 Nov. 87(5):1129-34. [Medline]. [Full Text]. Hamza MA, White PF, Ahmed HE, et al. Effect of the frequency of transcutaneous electrical nerve stimulation on the postoperative opioid analgesic requirement and recovery profile. Anesthesiology. 1999 Nov. 91(5):1232-8. [Medline]. Pearl ML, Fischer M, McCauley DL, et al. Transcutaneous electrical nerve stimulation as an adjunct for controlling chemotherapy-induced nausea and vomiting in gynecologic oncology patients. Cancer Nurs. 1999 Aug. 22(4):307-11. [Medline]. Roscoe JA, Matteson SE, Morrow GR, et al. Acustimulation wrist bands are not effective for the control of chemotherapy-induced nausea in women with breast cancer. J Pain Symptom Manage. 2005 Apr. 29(4):376-84. Rowbotham DJ. Recent advances in the non-pharmacological management of postoperative nausea and vomiting. Br J Anaesth. 2005 Jul. 95(1):77-81. [Medline]. [Full Text]. Solomon RA, Viernstein MC, Long DM. Reduction of postoperative pain and narcotic use by transcutaneous electrical nerve stimulation. Surgery. 1980 Feb. 87(2):142-6. Murina F, Bianco V, Radici G, et al. Transcutaneous electrical nerve stimulation to treat vestibulodynia: a randomised controlled trial. BJOG. 2008 Aug. 115(9):1165-70. [Medline]. Kita K, Otaka Y, Takeda K, Sakata S, Ushiba J, Kondo K, et al. A pilot study of sensory feedback by transcutaneous electrical nerve stimulation to improve manipulation deficit caused by severe sensory loss after stroke. J Neuroeng Rehabil. 2013 Jun 13. 10(1):55. [Medline]. Poitras S, Brosseau L. Evidence-informed management of chronic low back pain with transcutaneous electrical nerve stimulation, interferential current, electrical muscle stimulation, ultrasound, and thermotherapy. Spine J. 2008 Jan-Feb. 8(1):226-33. [Medline]. Ahmed HE, Craig WF, White PF, et al. Percutaneous electrical nerve stimulation (PENS): a complementary therapy for the management of pain secondary to bony metastasis. Clin J Pain. 1998 Dec. 14(4):320-3. [Medline]. Ahmed HE, Craig WF, White PF, et al. Percutaneous electrical nerve stimulation: an alternative to antiviral drugs for acute herpes zoster. Anesth Analg. 1998 Oct. 87(4):911-4. [Medline]. [Full Text]. Aydin G, Tomruk S, Keles I, et al. Transcutaneous electrical nerve stimulation versus baclofen in spasticity: clinical and electrophysiologic comparison. Am J Phys Med Rehabil. 2005 Aug. 84(8):584-92. [Medline]. Banerjee T. Letter: Transcutaneous nerve stimulation for pain after spinal injury. N Engl J Med. 1974 Oct 10. 291(15):796. [Medline]. Benedetti F, Amanzio M, Casadio C, et al. Control of postoperative pain by transcutaneous electrical nerve stimulation after thoracic operations. Ann Thorac Surg. 1997 Mar. 63(3):773-6. [Medline]. Berman BM, Swyers JP. Applying alternative medical approaches to managing chronic pain syndromes: If not now, when?. APS Bulletin. 1998. 8:4-6. Bertalanffy A, Kober A, Bertalanffy P, et al. Transcutaneous electrical nerve stimulation reduces acute low back pain during emergency transport. Acad Emerg Med. 2005 Jul. 12(7):607-11. [Medline]. Bloodworth D, Callvillo O, Smith K, et al. Chronic pain syndromes: evaluation and treatment. Braddom R, ed. Physical Medicine and Rehabilitation. 2nd ed. Mosby; 2000. 913-33. Bower WF, Moore KH, Adams RD, et al. A urodynamic study of surface neuromodulation versus sham in detrusor instability and sensory urgency. J Urol. 1998 Dec. 160(6 Pt 1):2133-6. [Medline]. Bushnell MC, Marchand S, Tremblay N, et al. Electrical stimulation of peripheral and central pathways for the relief of musculoskeletal pain. Can J Physiol Pharmacol. 1991 May. 69(5):697-703. [Medline]. Cheing GL, Luk ML. Transcutaneous electrical nerve stimulation for neuropathic pain. J Hand Surg [Br]. 2005 Feb. 30(1):50-5. [Medline]. Chen H, Lamer TJ, Rho RH, et al. Contemporary management of neuropathic pain for the primary care physician. Mayo Clin Proc. 2004 Dec. 79(12):1533-45. [Medline]. CMS details coverage of electrical stimulation and electromagnetic therapy for wound treatment in home health setting. Home Healthc Nurse. 2004 Oct. 22(10):676. [Medline]. D'Alberto A. Auricular acupuncture in the treatment of cocaine/crack abuse: a review of the efficacy, the use of the National Acupuncture Detoxification Association protocol, and the selection of sham points. J Altern Complement Med. 2004 Dec. 10(6):985-1000. [Medline]. Danziger N, Rozenberg S, Bourgeois P, et al. Depressive effects of segmental and heterotopic application of transcutaneous electrical nerve stimulation and piezo-electric current on lower limb nociceptive flexion reflex in human subjects. Arch Phys Med Rehabil. 1998 Feb. 79(2):191-200. [Medline]. Deyo RA, Walsh NE, Martin DC, et al. A controlled trial of transcutaneous electrical nerve stimulation (TENS) and exercise for chronic low back pain. N Engl J Med. 1990 Jun 7. 322(23):1627-34. [Medline]. Eriksson MB, Sjolund BH, Sundbarg G. Pain relief from peripheral conditioning stimulation in patients with chronic facial pain. J Neurosurg. 1984 Jul. 61(1):149-55. [Medline]. Fagade OO, Oginni FO, Obilade TO. Comparative study of the therapeutic effect of a systemic analgesic and transcutaneous electrical nerve stimulation (TENS) on post-IMF trismus and pain in Nigerian patients. Niger Postgrad Med J. 2005 Jun. 12(2):97-101. [Medline]. Frampton V. Transcutaneous electrical nerve stimulation and chronic pain. Wells PE, Frampton V, Borosher D, eds. Pain Management in Physical Therapy. Norwalk, CT: Appleton & Lange; 1988. Frick U, Kharraz A, Hauser S, et al. Comparison perception of singular transcranial magnetic stimuli by subjectively electrosensitive subjects and general population controls. Bioelectromagnetics. 2005 May. 26(4):287-98. [Medline]. Gadsby G, Flowerdew M. Nerve stimulation for low back pain--a review. Nurs Stand. 1997 Jul 16. 11(43):32-3. [Medline]. Gaillet JC, Biraud JC, Bessou M, et al. Modifications of baropodograms after transcutaneous electric stimulation of the abductor hallucis muscle in humans standing erect. Clin Biomech (Bristol, Avon). 2004 Dec. 19(10):1066-9. [Medline]. Ghoname EA, Craig WF, White PF. Percutaneous electrical nerve stimulation (PENS): an alternative to opioid analgesics for treating headache pain after electroconvulsive therapy. Headache. 1999. 39:502-5. Ghoname EA, Craig WF, White PF, et al. Percutaneous electrical nerve stimulation for low back pain: a randomized crossover study. JAMA. 1999 Mar 3. 281(9):818-23. [Medline]. [Full Text]. Ghoname EA, White PF, Ahmed HE, et al. Percutaneous electrical nerve stimulation: an alternative to TENS in the management of sciatica. Pain. 1999 Nov. 83(2):193-9. [Medline]. Ghoname ES, Craig WF, White PF, et al. The effect of stimulus frequency on the analgesic response to percutaneous electrical nerve stimulation in patients with chronic low back pain. Anesth Analg. 1999 Apr. 88(4):841-6. [Medline]. [Full Text]. Grant DJ, Bishop-Miller J, Winchester DM, et al. A randomized comparative trial of acupuncture versus transcutaneous electrical nerve stimulation for chronic back pain in the elderly. Pain. 1999 Jul. 82(1):9-13. [Medline]. Gyory AN, Caine DC. Electric pain control (EPC) of a painful forearm amputation stump. Med J Aust. 1977 Jul 30. 2(5):156-8. [Medline]. Han JS, Chen XH, Sun SL. Effect of low- and high-frequency TENS on Met-enkephalin-Arg-Phe and dynorphin A immunoreactivity in human lumbar CSF. Pain. 1991 Dec. 47(3):295-8. [Medline]. Hargitai IA, Sherman RG, Strother JM. The effects of electrostimulation on parotid saliva flow: a pilot study. Oral Surg Oral Med Oral Pathol Oral Radiol Endod. 2005 Mar. 99(3):316-20. [Medline]. Hu WQ, Zhang Z, Zhou P, et al. [Clinical observation on effect of qiangji recipe combined with physical therapy in treating ankylosing spondylitis]. Zhongguo Zhong Xi Yi Jie He Za Zhi. 2005 Jan. 25(1):64-6. [Medline]. Johnson MI, Ashton CH, Thompson JW. The consistency of pulse frequencies and pulse patterns of transcutaneous electrical nerve stimulation (TENS) used by chronic pain patients. Pain. 1991 Mar. 44(3):231-4. [Medline]. Johnston TE, Smith BT, Betz RR. Strengthening of partially denervated knee extensors using percutaneous electric stimulation in a young man with spinal cord injury. Arch Phys Med Rehabil. 2005 May. 86(5):1037-42. [Medline]. Jonsdottir S, Bouma A, Sergeant JA, et al. Effects of transcutaneous electrical nerve stimulation (TENS) on cognition, behavior, and the rest-activity rhythm in children with attention deficit hyperactivity disorder, combined type. Neurorehabil Neural Repair. 2004 Dec. 18(4):212-21. [Medline]. Khadilkar A, Milne S, Brosseau L, et al. Transcutaneous electrical nerve stimulation (TENS) for chronic low-back pain. Cochrane Database Syst Rev. 2005 Jul 20. CD003008. [Medline]. King EW, Audette K, Athman GA, et al. Transcutaneous electrical nerve stimulation activates peripherally located alpha-2A adrenergic receptors. Pain. 2005 Jun. 115(3):364-73. [Medline]. Kiser RS, Khatami MJ, Gatchel RJ. Acupuncture relief of chronic pain syndrome correlates with increased plasma met-enkephalin concentrations. Lancet. 1983 Dec 17. 2(8364):1394-6. [Medline]. Kruger LR, van der Linden WJ, Cleaton-Jones PE. Transcutaneous electrical nerve stimulation in the treatment of myofascial pain dysfunction. S Afr J Surg. 1998 Feb. 36(1):35-8. [Medline]. Ledergerber CP. Postoperative electro-analgesia. Obstet Gynaecol. 1978. 151:338. Lewith G, Kenyon J, Lewis P. Complementary Medicine: An Integrated Approach. New York, NY: Oxford University Press; 1996. Linzer M, Long DM. Transcutaneous neural stimulation for relief of pain. IEEE Trans Biomed Eng. 1976 Jul. 23(4):341-5. [Medline]. Luijpen MW, Swaab DF, Sergeant JA, et al. Effects of transcutaneous electrical nerve stimulation (TENS) on memory in elderly with mild cognitive impairment. Behav Brain Res. 2005 Mar 30. 158(2):349-57. [Medline]. Lund I, Lundeberg T, Kowalski J, et al. Gender differences in electrical pain threshold responses to transcutaneous electrical nerve stimulation (TENS). Neurosci Lett. 2005 Feb 28. 375(2):75-80. Lundeberg T, Bondesson L, Lundstrom V. Relief of primary dysmenorrhea by transcutaneous electrical nerve stimulation. Acta Obstet Gynecol Scand. 1985. 64(6):491-7. [Medline]. Macgregor K, Gerlach S, Mellor R, et al. Cutaneous stimulation from patella tape causes a differential increase in vasti muscle activity in people with patellofemoral pain. J Orthop Res. 2005 Mar. 23(2):351-8. [Medline]. McDowell BC, McCormack K, Walsh DM, et al. Comparative analgesic effects of H-wave therapy and transcutaneous electrical nerve stimulation on pain threshold in humans. Arch Phys Med Rehabil. 1999 Sep. 80(9):1001-4. [Medline]. Miles J, Lipton S. Phantom limb pain treated by electrical stimulation. Pain. 1978 Dec. 5(4):373-82. [Medline]. Myers RA, Woolf CJ, Mitchell D. Management of acute traumatic pain by peripheral transcutaneous electrical stimulation. S Afr Med J. 1977 Aug 13. 52(8):309-12. [Medline]. Nadler SF. Nonpharmacologic management of pain. J Am Osteopath Assoc. 2004 Nov. 104(11 Suppl 8):S6-12. [Medline]. [Full Text]. Nashold BS. Peripheral nerve stimulation for pain. J Neurosurg. 1980 Jul. 53(1):132-3. [Medline]. Nathan PW, Wall PD. Treatment of post-herpetic neuralgia by prolonged electric stimulation. Br Med J. 1974 Sep 14. 3(5932):645-7. [Medline]. [Full Text]. Norrbrink Budh C, Lundeberg T. Non-pharmacological pain-relieving therapies in individuals with spinal cord injury: a patient perspective. Complement Ther Med. 2004 Dec. 12(4):189-97. [Medline]. Paillard T, Noé F, Edeline O. [Neuromuscular effects of superimposed and combined transcutaneous electrical stimulation with voluntary activity: a review]. Ann Readapt Med Phys. 2005 Apr. 48(3):126-37. [Medline]. Palmer ST, Martin DJ, Steedman WM, et al. Alteration of interferential current and transcutaneous electrical nerve stimulation frequency: effects on nerve excitation. Arch Phys Med Rehabil. 1999 Sep. 80(9):1065-71. [Medline]. Paris P. Treating the patient in pain. In: Emergency Medicine. 1996:66-85. Parry CB. Pain in avulsion lesions of the brachial plexus. Pain. 1980 Aug. 9(1):41-53. [Medline]. Paternostro-Sluga T, Fialka C, Alacamliogliu Y, et al. Neuromuscular electrical stimulation after anterior cruciate ligament surgery. Clin Orthop Relat Res. 1999 Nov. 166-75. [Medline]. Popovic MR, Keller T. Modular transcutaneous functional electrical stimulation system. Med Eng Phys. 2005 Jan. 27(1):81-92. [Medline]. Razavi M, Jansen GB. Effects of acupuncture and placebo TENS in addition to exercise in treatment of rotator cuff tendinitis. Clin Rehabil. 2004 Dec. 18(8):872-8. [Medline]. Richardson RR, Meyer PR, Cerullo LJ. Neurostimulation in the modulation of intractable paraplegic and traumatic neuroma pains. Pain. 1980 Feb. 8(1):75-84. [Medline]. Simkin P, Bolding A. Update on nonpharmacologic approaches to relieve labor pain and prevent suffering. J Midwifery Womens Health. 2004 Nov-Dec. 49(6):489-504. Simpson KH, Ward J. A randomized, double-blind, crossover study of the use of transcutaneous spinal electroanalgesia in patients with pain from chronic critical limb ischemia. J Pain Symptom Manage. 2004 Nov. 28(5):511-6. Smania N, Corato E, Fiaschi A, et al. Repetitive magnetic stimulation: a novel therapeutic approach for myofascial pain syndrome. J Neurol. 2005 Mar. 252(3):307-14. [Medline]. Streitberger K, Kleinhenz J. Introducing a placebo needle into acupuncture research. Lancet. 1998 Aug 1. 352(9125):364-5. [Medline]. Sutbeyaz ST, Koseoglu BF, Yeşiltepe E, et al. Simultaneous upper and lower extremity complex regional pain syndrome type I in tetraplegia. Spinal Cord. 2005 Apr 19. Sylvester K, Kendall GP, Lennard-Jones JE. Treatment of functional abdominal pain by transcutaneous electrical nerve stimulation. Br Med J (Clin Res Ed). 1986 Aug 23. 293(6545):481-2. Takakura N, Yajima H, Homma I. Inhibitory effect of pain-eliciting transcutaneous electrical stimulation on vibration-induced finger flexion reflex in the human upper limb. Jpn J Physiol. 2004 Jun. 54(3):243-8. Tekeoglu Y, Adak B, Goksoy T. Effect of transcutaneous electrical nerve stimulation (TENS) on Barthel Activities of Daily Living (ADL) index score following stroke. Clin Rehabil. 1998 Aug. 12(4):277-80. Tinazzi M, Zarattini S, Valeriani M, et al. Long-lasting modulation of human motor cortex following prolonged transcutaneous electrical nerve stimulation (TENS) of forearm muscles: evidence of reciprocal inhibition and facilitation. Exp Brain Res. 2005 Mar. 161(4):457-64. Treacy K. Awareness/relaxation training and transcutaneous electrical neural stimulation in the treatment of bruxism. J Oral Rehabil. 1999 Apr. 26(4):280-7. [Medline]. Tsen LC, Thomas J, Segal S, et al. Transcutaneous electrical nerve stimulation does not augment combined spinal epidural labour analgesia. Can J Anaesth. 2000 Jan. 47(1):38-42. Vaiman M, Shlamkovich N, Eviatar E, Segal S. Treatment of nasal valve collapse with transcutaneous and intranasal electric stimulation. Ear Nose Throat J. 2004 Nov. 83(11):757-62, 764. Walsh DM, Lowe AS, McCormack K, et al. Transcutaneous electrical nerve stimulation: effect on peripheral nerve conduction, mechanical pain threshold, and tactile threshold in humans. Arch Phys Med Rehabil. 1998 Sep. 79(9):1051-8. [Medline]. Walsh DM, Noble G, Baxter GD, et al. Cct A preliminary study on the effect of various transcutaneous electrical nerve stimulation (TENS) parameters upon the RIII nociceptive and H-reflexes in humans (Arch Phys Med Rehabilitation, 2000, Mar;81(3):324-33). Ir J Med Sci. 1997. 166(3):179-80. Ward AR, Robertson VJ. Variation in torque production with frequency using medium frequency alternating current. Arch Phys Med Rehabil. 1998 Nov. 79(11):1399-404. [Medline]. Weber DC, Brown AW. Physical agent modalities. Braddom RL, ed. Physical Medicine & Rehabilitation. 2nd ed. Mosby; 2000. 453-5. White PF, Phillips J, Proctor TJ, et al. Percutaneous Electrical Nerve Stimulation (PENS): A Promising Alternative-Medicine Approach to Pain Management. Vol 9. American Pain Society Bulletin. 1999. Widerström-Noga E, Dyrehag LE, Börglum-Jensen L, et al. Pain threshold responses to two different modes of sensory stimulation in patients with orofacial muscular pain: psychologic considerations. J Orofac Pain. 1998 Winter. 12(1):27-34. [Medline]. Wilentz J. NIH consensus development conference on acupuncture. APS Bulletin. 1998. 8(2):1, 21. Woolf CJ, Thompson JW. Stimulation-induced analgesia: transcutaneous electrical nerve stimulation (TENS) and vibration. Wall PD, Melzack R, eds. Textbook of Pain. 3rd ed. New York, NY: Churchill Livingstone; 1994. Yang EH, Barsness GW, Gersh BJ, et al. Current and future treatment strategies for refractory angina. Mayo Clin Proc. 2004 Oct. 79(10):1284-92. [Medline]. Zaidi AS, Russell IF. Is transcutaneous electrical stimulation a realistic surrogate for genuine surgical stimulation during spinal anesthesia for cesarean delivery?. Anesth Analg. 2005 May. 100(5):1477-81, table of contents. [Medline]. [Full Text].